Find your way to the Birchwood Inn of Lenox, Massachusetts and you will discover the stunning beauty and culture of the New England Berkshires. You will also find yourself catered to their most famous of luxuries: original recipe, award-winning breakfasts. The Birchwood has welcomed guests to its stone-fenced gardens nearly 250 years. Offering comfortably elegant rooms with immaculate private baths, the Birchwood is proud to be part of Select Registry, Distinguished Inns of America, and A Diamond Collection Inn. 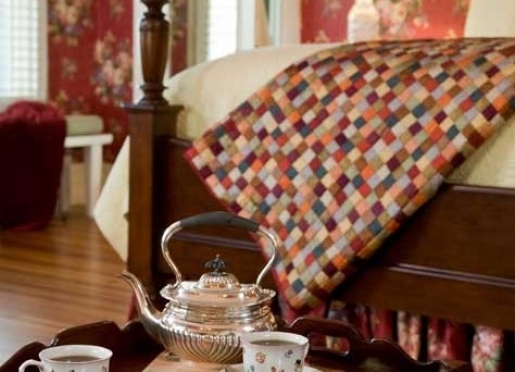 Dating back to 1766, the Inn is a gem of colonial history. The property now known as Birchwood Inn was the first residential property deeded by the Massachusetts Bay Colony. However, the fame of the Birchwood is not just written in its history; a proud member of Eight Broads in the Kitchen, it is a sensory legend. 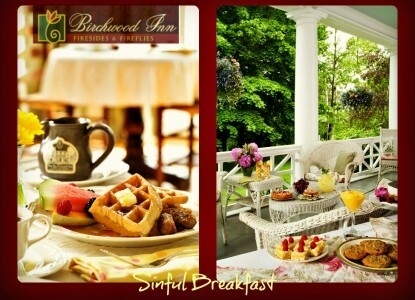 Celebrated for its award- winning breakfasts, the Birchwood Inn has won multiple awards including “Best Breakfast in New England”, “Best Savory Breakfast – 2013”, and “Top 50 US Bed and Breakfasts for Food.” Every morning, expect to be greeted by a full country breakfast complete with homemade breads and entrees, a seasonal selection of locally grown fruits, and a selection of teas and coffee. But the famous fare doesn’t stop at the breakfast table. Birchwood also offers afternoon tea and treats, ranging from hot chocolate chip and mudslide cookies, strawberry-rhubarb pie, and prize-winning apple cake. New owners Tom and Debbie and working to maintain the reputation of culinary uniqueness pioneered by Ellen, the previous owner and the warm home away from home welcome that awaits Birchwood's guests. Travelers are always looking for memorable and relaxing experiences. Let’s discover more through the words of our innkeepers. Many thanks to Deborah for sharing her own secrets with BBOnline.com! Why do most travelers stay at your inn? The summer in the Berkshires is a lovely mountainous escape starting with a full breakfast, early morning relaxing on the large front porch, visits to the Norman Rockwell museum, tours of “Cottages” built by the likes of Vanderbilts and Carnegies, hiking on 15 miles of wooded trails across the street from the inn in Kennedy Park and an evening of dance, theatre or the Boston Symphony at the Tanglewood music venue. What are you best known for? What makes your inn unique? What do you love most about your inn? Built in 1766 the inn has earned a reputation for hospitality and good food. Our guests put smiles on our faces every day. If someone has never been to your city, what is the #1 reason to come visit? The wealth of cultural amenities such as Tanglewood, Shakespeare and Company, Jacob’s Pillow outdoor dance theatre and Kripalu international yoga center draw the most crowds. What’s the best kept secret about the area? The Clark museum in nearby Williamstown houses original Impressionist paintings collected during the lifetimes of the artists. If a traveler is staying at your inn for 4 nights, what should he/she do in the area? Depending on whether travelers enjoy cultural activities or outdoor activities, they can choose either. Is there anything within walking distance of your inn? The village of Lenox is one block away at the bottom of the hill with its dozen or more restaurants, a variety of upscale shops and a big city quality wine store. What is your favorite restaurant/food in the area? Table Six offers an elegant ambiance and outstanding food. We also enjoy the French cuisine found at the Chez Nous restaurant in the next town, just a short drive down to Lee. Do you accept pets? We have several rooms that we consider dog friendly. No cats. 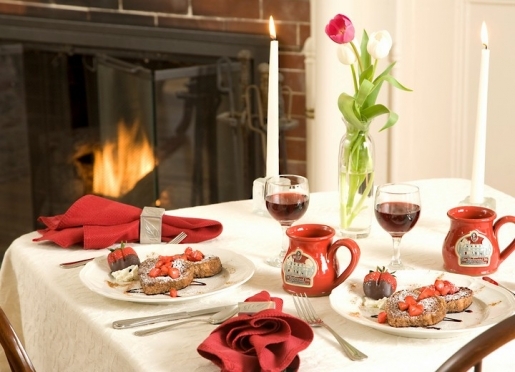 Imagine…awakening to the aroma of freshly brewed coffee and homemade breads baking in the oven… savoring memorable souffles and pancakes, crisps and fruitinis… Voted BEST Breakfast in New England, says Arringtons! 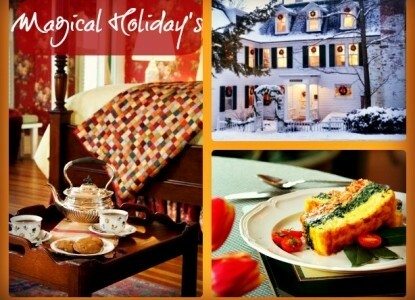 Taste our Lenox MA Bed and Breakfast menus! Imagine…a pastoral country morning… stone-fenced gardens… our tranquil front porch, enjoying afternoon tea and the Berkshire breeze… curling up next to a blazing hearth with a good read and a steaming mug of mulled cider… the romance of our 1766 Lenox B&B mansion. Berkshires Bed and BreakfastImagine…fireflies in the summer twilight… a hammock and spring blossoms… autumn’s vibrant foliage… firesides and snow angels. Imagine…hiking, biking or snowshoeing on neighboring Kennedy Park’s trails… a short walk to historic Lenox… picnicking at Tanglewood… exploring Edith Wharton’s The Mount and Norman Rockwell’s Stockbridge… water sports on Berkshire lakes… de-stressing in a Kripalu yoga class… luxuriating in a day at the spa… all at the doorstep of our Berkshires Inn. The immaculate guest rooms at our Berkshires bed and breakfast are named after former owners of the mansion, dating back to 1766. All rooms have luxurious, freshly ironed sheets, a private bath, air-conditioning, telephones, toiletries, and hairdryers. WiFi is available throughout our Lenox MA bed and breakfast. Click any of the rooms below for additional information about our unique and beautiful Berkshires bed & breakfast rooms. Our guests have voted Birchwood Inn “Best Breakfast in New England”, and we continually strive to meet and exceed your expectations. We use only the freshest ingredients in our homemade breads and muffins, fruits and entries, and take special pride in preparing and serving our full country breakfast each morning at our Lenox MA Bed and Breakfast. Breakfast is served in our 19th century dining room – fireside or overlooking the front garden – generally between 9:00 a.m. (a bit earlier in the summer) and 10:00 a.m. Freshly brewed coffee and hot water for tea are available in the dining room by 7:45 a.m. When you sit down at your table for two, we’re right there with our piping hot specially blended coffee. If you choose from one of our varied selection of teas, we’re happy to make you a fresh pot. And you’ll soon discover that our orange juice is freshly squeezed. Please help yourself to the inn-made tea breads and breads for toasting, yogurts, and cereals at our Bed and Breakfast in Lenox MA. Enjoy the daily fruit dish as your first course, and when you’re ready, we’ll present you with the hot entrie of the day. 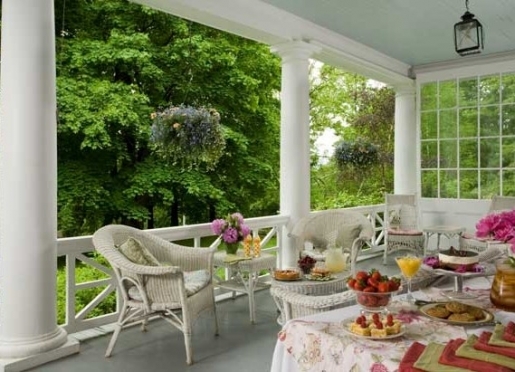 After a day of sightseeing and antiquing, concerts and plays, museums and historic homes, or hiking and skiing, put your feet up, relax and refresh with afternoon tea and freshly baked pastries fireside in cool seasons and porch-side in warmer ones at our Lenox B&B. Our mulled local cider takes the chill out of winter while our freshly brewed iced tea refreshes you in summer. Our teatime treat of the day depends on our muse. Chocolate chip cookies, hot out of the oven. Decadent mudslide cookies. Strawberry-rhubarb pie. Aunt Norma’s brownies. Prize-winning apple cake. Pear upside-down gingerbread. Berry cobbler. Chocolate fallen souffle cake. Don’t want to spoil your appetite for dinner? You will often find these goodies in the Butler’s Pantry for your midnight snack. Lenox is in the heart of the Berkshires, America’s premier cultural resort, which offer something for just about everyone year-round. Visiting the Berkshires unlocks a world of New England scenic beauty, thought- and sense-provoking historical, literary and artistic experiences, exhilarating sports and recreation, and world-class music, theater and dance festivals. The Berkshires also boast award-winning restaurants, charming antique stores and awesome foliage. The Berkshires are truly a resort for all seasons. Equipping adventurers for 30+ yrs. ; gear, clothing, footwear & travel needs. 4-season rentals; bikes, kayaks, skis, snowshoes. (413) 637.3010. 91 Pittsfield Rd., Lenox. Berkshire Outfitters Outdoor equipment, adjacent to Mt. Greylock & the bike path. Canoes, kayaks, mt. bikes, snowshoes, xc-skis, and camping gear. Sales and rentals. (413) 743.5900. Rte. 8, Adams. Birchwood inn has been welcoming friends, new and old, for 240 years. The property which is now our Berkshires Bed & Breakfast was the first residential property in Lenox deeded by the Massachusetts Bay Colony in 1765. The core of the house, the oldest home in Lenox, dates from 1766-67 and was built by Israel Dewey. The house served as an inn in those early years. The first town meeting was held here on March 11, 1767, the year that the Town of Lenox was incorporated. The meeting’s agenda included the organization of the town government, and at the time Israel Dewey was elected to the first Board of Selectmen. Dewey was a man substance, and his home was most likely wood-framed, glazed and later plastered and shingled. Dewey was on the town’s Continental Congress committee and was one of the first men in Lenox to volunteer in the Revolutionary War. In addition to being a farmer and involved in town affairs, Dewey was also a schoolmaster. Talk about multi-tasking! The home has changed hands many times over the years, and all of the inn’s guest rooms are named in honor of some of the former residents. 18th century owners included Edward Gray, Simon and Rachel Smith, Edward Hay, David and Daniel Fellows, Samuel Wright (the first town clerk), Joseph Goodwin, and Luke Gates, a blacksmith. Colonel Laddock Hubbard purchased the property in 1798, and the home became a tavern. In 1806, one of the town’s most illustrious figures, Azariah Egleston, to whom the monument at the foot of Main Street is dedicated, bought the property. The price by this time had risen to $2,000.00. Not a bad investment! Ten years later he forfeited the property to satisfy an unpaid debt. In April 1775, in anticipation of the Revolutionary War, Egleston had enlisted in the regiment of Colonel John Paterson. Egleston marched with the regiment immediately after the Battle of Lexington, crossed the Delaware with Washington, and fought in the battles of Princeton and Trenton. He served against Burgoyne and was at Saratoga when Burgoyne surrendered. John Hancock promoted Egleston to the rank of ensign, and before the end of the war, he had reached the rank of major and later served in Shay’s Rebellion. Egleston was a friend of Washington, Kosciusko, and Lafayette. He was married to Hannah Paterson, the daughter of Major General Patterson, whom he so loyally served during the war. Lenox, Mass. 1839 A reprint from Barber's "Hist. Coll. of Mass." After the war, Egleston helped make Lenox a prominent center of education. He deeded land, as well as a building to the Lenox Academy which figured so significantly in Lenox during the 19th century. Not only was Egleston a patriot, he was also noted for his hospitality, welcoming both army officers and men of literature and learning to his home. Who knows what famous people were guests here? Elected State Senator, he later served as a justice of the Court of Sessions. A patriot and public servant, Egleston and his wife Hannah are buried in the churchyard across the street from the inn. Birchwood remained in the Dana family for 68 years, until 1953 when it was purchased by Charlotte Wagner, who converted the mansion to an inn. In the 1960s and 70s, the Schallers made the house a home for World War II veterans. The inn has been host to a ghost or two. Many guests have heard what sounds like a cat crying in The Loring Room, and the Wagner Room’s poltergeist likes to move things around. Village legend, moreover, claims that the ghost of Col. Hubbard and his horse can sometimes be seen galloping along Hubbard Street! Since 1999, Birchwood has welcomed guests from 47 states, seven Canadian provinces plus the Northwest Territories, six of the seven continents, and 28 countries, including Turkey, Dubai, and Iceland. A repeat guest who comes the farthest travels to Lenox from Siberia! The Taconic Parkway or New York Thruway North (I-87) to the Massachusetts Turnpike (I-90) East (Exit 21A from Thruway). Mass Pike Exit 2, Lee, MA. Turn right at the end of exit ramp to US 20 West. US 20 for 3.9 miles. Turn left at the second light onto Rte. 183 South/Walker Street to Historic Lenox. Bear right at the monument (Main Street/7A) and continue to nearly the top of the hill. Turn right onto Hubbard Street and left into the first driveway. Parking and the inn entrance are around the back of our Lenox MA Inn. The Garden State Parkway or Rte. 287 North to the New York Thruway (I-87) North. Exit 21A to the Mass Pike (I-90). Turn right at the end of the exit ramp onto US 20 West. US 20 West for 3.9 miles. Parking and the inn entrance are around the back of our Lenox Bed and Breakfast. The Massachusetts Turnpike (I-90) West. Turn right at the end of the exit ramp onto US 20. Turn right on Hubbard Street and left into the first driveway. Parking and the inn entrance are around the back of our Lenox MA Lodging. I-91 South to the Mass Pike (I-90). West (right) onto US 20 for 3.9 miles. Turn left at the second light onto 183 South/Walker Street to Historic Lenox. Parking and the inn entrance are around the back of our Lenox Massachusetts Lodging. The New York State (Gov. Thomas E. Dewey) Thruway (I-90) South/East. In Albany, continue to follow I-90 South towards Boston and the Mass Pike (I-90). Exit 2 from the Mass Pike, Lee, MA.